Didn’t Southampton realise they were bringing in the worst version of Balotelli and Barton? Southampton’s record signing Dani Osvaldo looks set to leave the club after half a season following his latest violent outburst, which left a team-mate bloodied on the training ground. Argentine-born Italy forward Osvaldo reportedly attacked defender Jose Fonte after taking exception to his colleague’s over-enthusiastic approach in a training match. Former Roma player, Osvaldo kicked and head-butted Fonte, with media reports claiming there was “blood everywhere”. Fonte is believed to have suffered a busted nose and a cut eye in the incident; Osvaldo has been suspended for two weeks, fined and transfer listed. But Southampton only have themselves to blame for this. A look at his CV has revealed a record of violence that would make even Joey Barton and Mario Balotelli fearful. Well, maybe not. The Southampton incident is just the latest in a long line of disgraces for the Buenos Aires-born hothead, all of which are linked to his fiery temper. After scoring the winning goal in Fiorentina’s 3-2 victory over Juventus, Osvaldo is sent off for removing his shirt and machine-gunning fans in celebration. Obviously there was no gun, or his punishment would have been much harsher. While at Roma, he confronts team-mate Erik Lamela (now of Tottenham) in the dressing room and makes his feelings known by punching him in the face. Lamela’s crime? Failing to pass to him during a defeat to Udinese. Osvaldo is fined and suspended for the incident, but makes up with Lamela afterwards. Osvaldo swears at and sarcastically applauds the referee during Roma’s 2-1 loss to Fiorentina. He is sent off and is suspended for two matches. Osvaldo deliberately elbows an Atalanta player in the face during a Coppa Italia match. He is suspended for three matches. Osvaldo screams abuse at Roma coach Aurelio Andreazzoli after being substituted during the 1-0 Coppa Italia final defeat against city rivals Lazio. Does not attend the runner-up medal presentation with his team-mates. Later, he tweets abuse at Andreazzoli, telling him to “go celebrate with the Lazio fans”. Falls out with the club and fans, and is sold to Southampton for £15m. The incident also costs him his Italy place for the Confederations Cup. 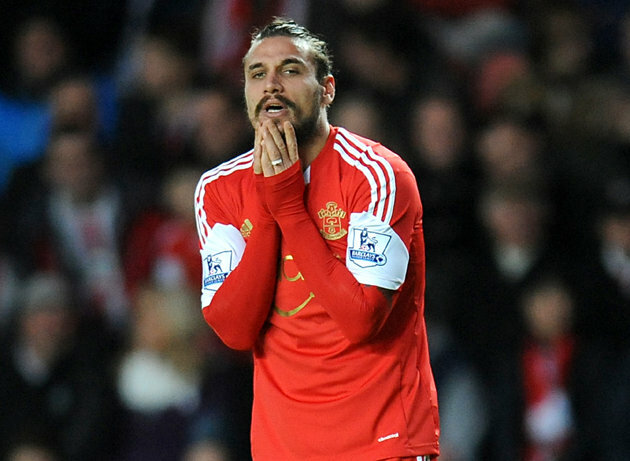 Now at Southampton, Osvaldo provokes a touchline brawl that involves several Newcastle players and members of the coaching staff. Banned for three matches and fined £40,000 by the FA. Still suspended for his antics against Newcastle, Osvaldo is on the brink of returning to action but he effectively ends his Southampton career by assaulting a colleague at work.